You plan every detail of your wedding, right down to the color of the soles of your shoes (they have to match your bridal theme! ), naturally you’d want your wedding day jewelry to be special too. 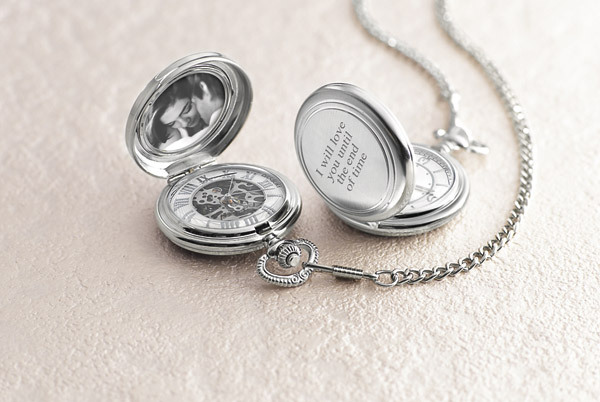 Things Remembered allows you to engrave heartfelt messages on beautiful, affordable wedding day jewelry — from a pocket watch for the groom to a lock and key bangle for you. 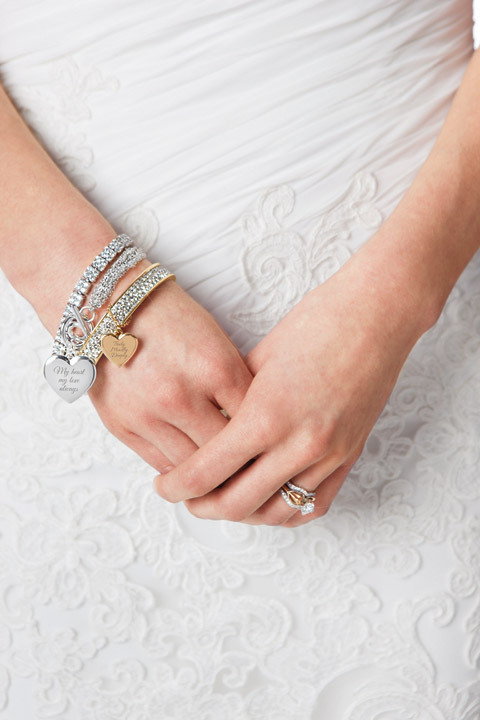 These keepsake pieces are thoughtfully-designed and engraved by artisans with years of experience, making them wonderful as gifts for your groom, a token of thanks for your bridesmaids, or a memento for yourself to mark a very special day. This Multi-Chain Bracelet features 12 delicate chains with a toggle clasp and polished silver heart-shaped charm. Engrave a favorite quote on the front and your initials or wedding date on the back, and then add a design or a custom wedding logo* for a really unique piece. This bracelet comes in a beautiful filigree box, which is free with any jewelry purchase, when personalized. The Vintage Flower Bracelet is perfect for the romantic bride! This feminine bracelet features a Victorian-inspired floral design set with CZ stones. You can personalize both the front and the back of the charm with your monogram, date or phrase. To complete the look, get the matching necklace and matching earrings. This Black Leather Braided Bracelet is a gift he’ll want to use every day! Engrave your initials and wedding date on this modern, masculine accessory which features a braided leather cord and stainless steel cylinder. The understated design is sleek enough for the wedding day, yet sturdy enough for daily wear. 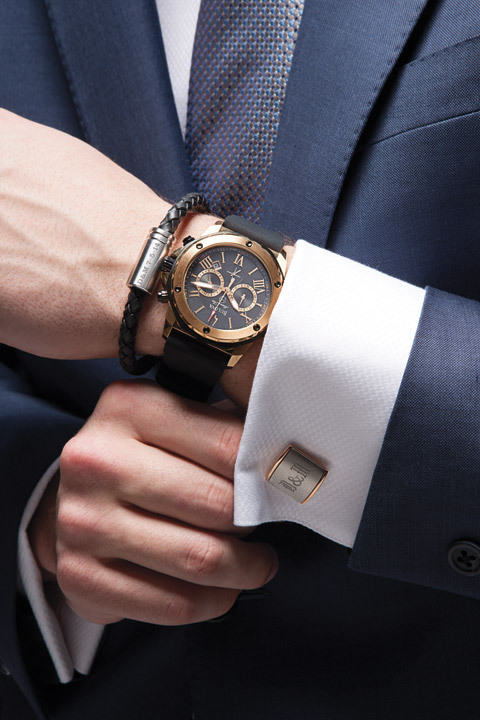 For the finishing touch, how about a pair of Stainless Steel and Rose Gold Cuff Links engraved with his initials? These come in a Tri Tone Valet Box, which is free when engraved, so they also make a great thank you gift for his best man. For more awesome ideas to personalize your wedding, check out Remembered Weddings. With a $150 minimum purchase, you get a FREE custom wedding logo that you can use on everything from your invitations and thank you notes to your engraved flutes and cake server set. With over 600 conveniently-located stores nationwide, creating your personalized keepsake is easy. Or just order online for home delivery or same-day in-store pickup. Oh, and don’t forget to sign up for Things Remembered’s complimentary bridal newsletter to receive your complimentary keepsake heart, custom engraved just for you. We know you love giveaways, and here’s one you don’t want to miss! Enter below to win a vintage flower bracelet + black leather bracelet set, complete with custom engraving^! Good luck!